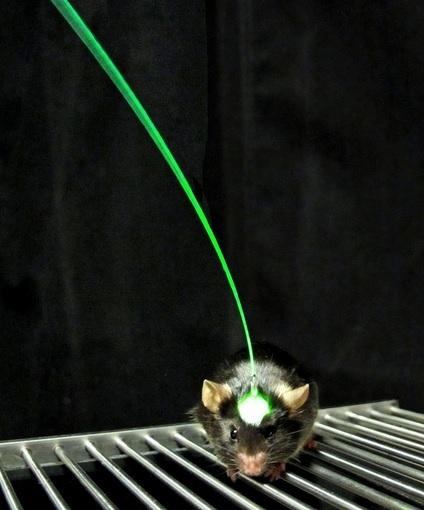 Stanford researchers use optogenetic technologies to stimulate mice brains post-stroke. Researchers at the Stanford School of Medicine have developed a new way to stimulate the brain to regrow damaged areas after a stroke occurs in mice, with potential to translate to treatment for strokes in humans even years after the initial stroke. The study, conducted by Gary Steinberg Ph.D. ’79 M.D. ’80, professor and chair of neurosurgery and the study’s senior author, was published Aug. 18 in Proceedings of the National Academy of Sciences. Last Wednesday, the study’s co-author, Karl Deisseroth Ph.D.’98 M.D. ’00, also won the 2014 Keio Medical Science Prize for his work with optogenetics. The Stanford team used a technique called optogenetics, a combination of optical and genetic methods, to selectively activate neurons that had been genetically sensitized to light. The mice were genetically altered to express a certain light-sensitive protein called rhodopsin, which could be selectively stimulated in the motor cortex, an area of the brain that controls movement, balance, strength and other physical activities. Using an optical fiber implanted in the mice’s brain motor cortexes, the researchers stimulated the location where a stroke, previously induced, occurred and monitored biochemical changes and blood flow to verify that the nerve cells were activated. Michelle Cheng, Stanford postdoctorate and research associate and first author of the study, said in an interview with HealthlineNews that a tiny fiber-optic blue laser wire was implanted in the mice for stroke treatment. When she turned on the light, the light-sensitive proteins caused the brain’s nerve cells to fire in very specific patterns. “Each mouse received three one-minute stimulations per day from day five to day 14 post-stroke,” Cheng said to The Daily. 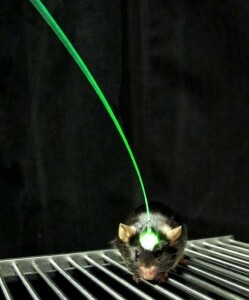 Two weeks after the optogenetic treatment, the mice that received the stimulation could walk the length of a horizontal beam rotating on its axis significantly more effectively than stroke-impaired mice whose primary motor cortexes had not been stimulated. The mice improved after a short period of time, according to Cheng. “At day seven we started to see improvement in terms of walking longer distances, and day 10 and 14 we saw walking at faster speed,” Cheng said. According to Steinberg, although these experiments were performed on mice, the discoveries are applicable to humans. Strokes are the leading cause of neurological disability in the United States today, with about 800,000 people suffering a stroke each year, resulting in about 130,000 fatalities. Of the survivors, 20 to 40 percent cannot care for themselves after one year. The current treatment for a stroke in the United States is an injectable medication called tissue plasminogen activator (tPA). It must be injected within a few hours of the stroke to limit the extent of the stroke damage, but only about five percent of stroke victims benefit from the treatment since they do not arrive at medical centers in time for the treatment to be effective. The light-driven technology, however, can promote recovery even after the initial damage has been done. “The hope is that stimulation of certain brain circuits could improve neurologic function in chronic stroke patients, who suffered a stroke years ago,” Steinberg said. Contact Jacqueline Carr at jacquelineecarr ‘at’ gmail.com.